What baby clothes to buy in advance!? Another thing I have quizzed my little sister and one of my friends about as it has been on my mind for a while now – I literally have no clue what you should dress a baby in. At all. Don’t even start with adding in the complexities of if they’re in the house of we’re going out, the time of year, etc. I just needed to know the bog basics first so I didn’t either go overboard with cool outfits (I must admit I have looked at so many baby clothes over the last few months!) or not have enough to get through the first few weeks. 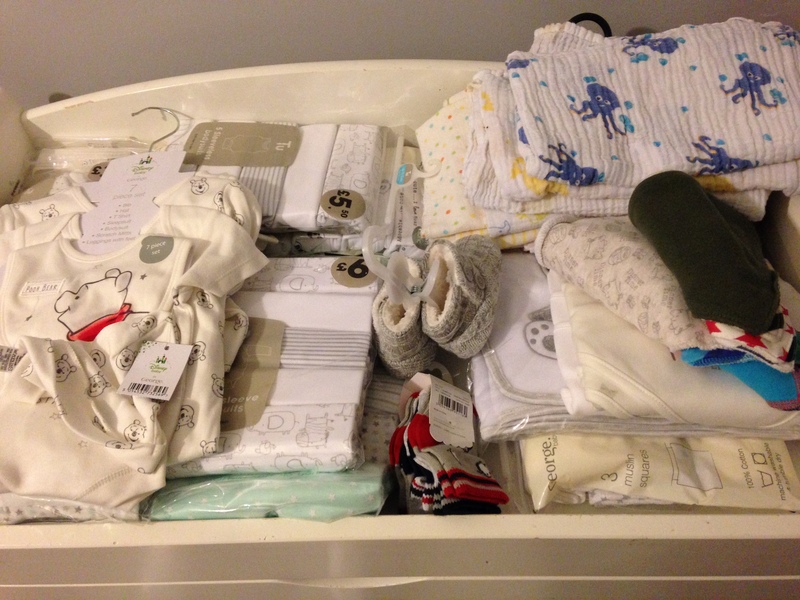 Plus, as we have kept the baby’s gender a surprise I have found that shopping for neutral clothes in the usual go-to places I’ve been told to look for baby clothes (supermarkets mostly as they offer great value and good quality and Mothercare). For example, Asda’s yellow clothes are definitely for girls with their choice of patterns which then leaves you with plain white and no detail (fine for some socks of bibs but not a whole wardrobe of stark white outfits!) or Disney-themed clothes (not everyone’s cup of tea). I got everything so far in a sale either at Boots or Asda/Tesco/Sainsbury’s. Someone told me Sainsbury’s always do a clothing sale during half term and luckily I managed to get some bits online whilst my sister picked some stuff up for me in the big store near her. I also got some scratch mits and two sets of booties (one from my sister). Sam and I are not the biggest fan of pink or blue clothes for girls and boys, we are far more likely to get more gender-neutral clothes with star or skull and crossbone patterns, superhero-themed tops and just anything funny rather than overtly “girl” or “boy” items. I have been quite open about this with all of my friends so hopefully if we have a girl we won’t be inundated with frilly pinkness. The only trouble with our taste in clothes is the potential cost. I would love to dress the baby up in only 80s/glam rock/superhero outfits everyday but the more unique clothes do tend to be more expensive than the perfectly nice options from high street stores and supermarkets. And realistically they are going to grow so fast at first than the daily awesome outfits can wait until they are a little older! That’s not to say I won’t be investing in some treat items from notonthehighstreet.com between now and March…!